Safety and gender equality cement Azerbaijan’s place as the shining example of a modern Muslim democracy. 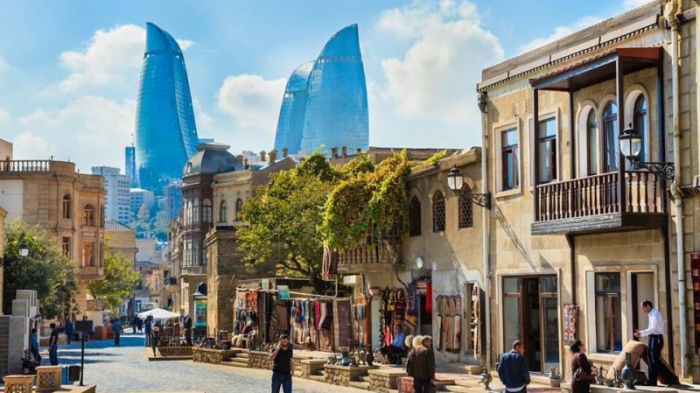 This spring thousands of Jews from Israel and at least as many Christians from Europe will arrive in Baku, capital of Azerbaijan, to spend a week celebrating the Passover or Easter holidays. This year’s popular destination is peculiar because Azerbaijan is a predominantly Shiite Muslim country. With its proud tradition of tolerance and secularity, Azerbaijan is home to a small but energetic Jewish community and several larger Christian congregations. All have lived side by side with their Muslim neighbours for generations. Anyone on the streets of Baku will be delighted to tell you about their beloved city’s cosmopolitan essence of multiculturalism and multi-confessionalism dating back centuries. Azerbaijan’s geographic location at the crossroads of the Great Silk Way has long established it as the place where cultures met and prospered together. Then at the end of the 19th century came the oil boom, bringing investors and workers from all over the world to Azerbaijan to help develop the world’s new most precious resource. A century later, their descendants are what defines modern Azerbaijan as one of the most culturally diverse places on Earth. Safety and gender equality further cement Azerbaijan’s place as the shining example of a modern Muslim democracy. Low crime rate and legendary hospitality make Baku one of the safest cities in the world where a young woman can walk home at night without risk or fear. Women are also well-represented in politics, both in the executive branch on the ministerial level and in the legislative branch as members of the Parliament. Azerbaijan’s political traditions trace their roots to the Azerbaijan Democratic Republic of 1918-1920. First democracy of the East, the ADR enshrined in law much of what makes up modern Azerbaijan’s Constitution, most importantly its citizen’s civil rights and freedoms. The Azerbaijan Democratic Republic was one of the world’s pioneers of universal suffrage, granting women full voting rights in 1918. Its cultural legacy, such as the first opera house in the Muslim world is proudly carried on in modern Azerbaijan. Decades under the Soviet rule did not quell Azerbaijan’s strong sense of national identity. Upon gaining independence in 1991 Azerbaijan has retaken its rightful place in the global community. Early years were difficult, marred by conflict with neighbouring Armenia over the military occupation of Azerbaijan’s territory. In the early nineties, citizens of Azerbaijan found themselves in the direst economic and political predicament following the collapse of the Soviet system. Complete disintegration of nearly all government institutions, extreme poverty and external aggression threatened the very existence of the fledgeling nation. Sweeping political and economic reforms led to rapid improvements in productivity and governance. New investments of capital and technology poured into Azerbaijan. GDP per capita has seen an astonishing six-fold increase. Azerbaijanis feel much more secure politically and their vastly increased economic opportunities allow them to engage with the world as an equal and respected partner. Literacy and health care access are universal. Bureaucratic red tape has been greatly reduced with the introduction of ASAN Service Centers. These all-in-one state agencies virtually overnight transformed many government services making them quick and accessible. In 2015 ASAN Service Centers earned the prestigious United Nations Public Service Award. Safe, affordable and hospitable Azerbaijan has become a popular tourist destination and an attractive place to invest and do business. Today Azerbaijan proudly wears the mantle of the great bridge between the East and West, the proverbial melting pot of cultures, confessions and ideas. Nearly three million tourists visited Azerbaijan and its radiant capital Baku last year. It is equally attractive to visitors from European Christian nations and from Muslim nations of the Persian Gulf, Iran and Turkey. Almost no one remains unmoved by the majesty of Icheri Sheher, the Old City, or skips a trip to the world-famous dirt volcanoes renowned for their rejuvenating properties. But it’s not just the lovingly preserved historical monuments that lure visitors. The skyscraper-studded skyline of Baku, its architectural wonders designed by some of the greatest creators of our time, such as the award-winning masterpiece Heydar Aliyev Center by Zaha Hadid, marries Azerbaijan historic origins with its youthful drive for the future. And then there is the legendary authentic Azerbaijani cuisine, a unique blend of savoury influences that became a fitting metaphor for the country itself with its dazzling cultural diversity. The great East-West divide which once defined human civilization is slowly giving way to a new era of cooperation and integration. Despite powerful headwinds, globalization advantages still provide strong incentives for deeper ties and even more robust trade partnerships. As the Western world searches for better models to breathe new life into its global world paradigm it will find a reliable and faithful partner in Azerbaijan, where these models are already a reality. At the same time, as nations of the East seek to establish themselves as equal strategic partners to the “old” West, they too need to look no further than Azerbaijan as the perfect example of the historical bridge connecting the ends of the Earth. Vadim Gusmanis is a University of Maryland and Boston University graduate with a background in science and journalism.